When I first saw the preview for Identity Thief, I can’t tell you how much I wanted it to be good. At first glance, it looked like it would be one of those comedies where all of the good parts are spoiled in the trailers. But my optimism kicked in, knowing that Jason Bateman was not only starring in the film – but also producing. Bateman is a comedian that I have really enjoyed watching since he made his comeback with Arrested Development, and I usually trust his judgement. On the other hand, the film co-stars Melissa McCarthy – an actress who I am obviously in the minority for thinking is not as funny as everyone says. Unfortunately my initial thoughts were true; while Bateman hits it out of the park, McCarthy’s jokes fall flat more often than not. Sandy Patterson (Jason Bateman) works as an accountant for a big investment firm, for a boss (Jon Favreau) who makes a whole lot more than him by doing a whole lot less for the company. When the time comes for bonuses, Sandy is asked to write checks for all of the executives – while the lower level employees are overlooked once again. This is the final straw for Sandy’s co-workers, who decide to leave and start their own firm. They offer Sandy a vice president position, with a five hundred percent raise to join them. With his financial troubles finally out of the way, he is ready to give his family the debt-free life he has always wanted to provide. Unfortunately at the same time, Sandy’s identity is being stolen by Diana (Melissa McCarthy) – who is racking up hundreds of thousands of dollars in debt unbeknownst to him. He discovers something is wrong when he goes to get gas, only to have his card cut at the pump. Eventually he is pulled over and arrested for an outstanding warrant, due to the trouble Diana is causing in his name. When the police pull up his supposed mug shot, it is not of him – but of a short, stocky woman with red hair. After speaking with the police, Sandy finds the only way to clear his good name is to find Diana and bring her back to Colorado for the police to handle. The premise for the film is good enough to work, but unfortunately the writing often seems lazy. Most of Bateman’s lines were great for his rigid, sarcastic sense of humor. But when it came to McCarthy, even her crazy amount of energy couldn’t save the film from awful jokes. I think part of the problem is that McCarthy just isn’t as funny as the writers try to make her be. They were obviously trying to pull off some kind of Tommy Boy or Planes, Trains & Automobiles road trip buddy movie, but the actress can’t hold a candle to Chris Farley or John Candy in that respect. The aforementioned actors always radiated such natural performances, where McCarthy’s just seems forced. Her best scenes were actually the more serious ones, where she actually gets emotional and even cries. And it was really good. Maybe that is the direction she should go, as she can obviously act. Although the film started off well, the script got sloppier and sloppier as it went along. Even though it is a comedy, some of the major plot points start to not make any sense, and the characters do things that are simply unnatural. It also seemed like some of the scenes were cut in at inappropriate times just to garnish a few laughs. Unfortunately for the film, most of them resulted in a silent theater. I think Bateman did a great job, but I really wish they would have paired him with someone like Kristen Wiig. Even though her look is completely different than McCarthy’s, I think she would have played the character much better. 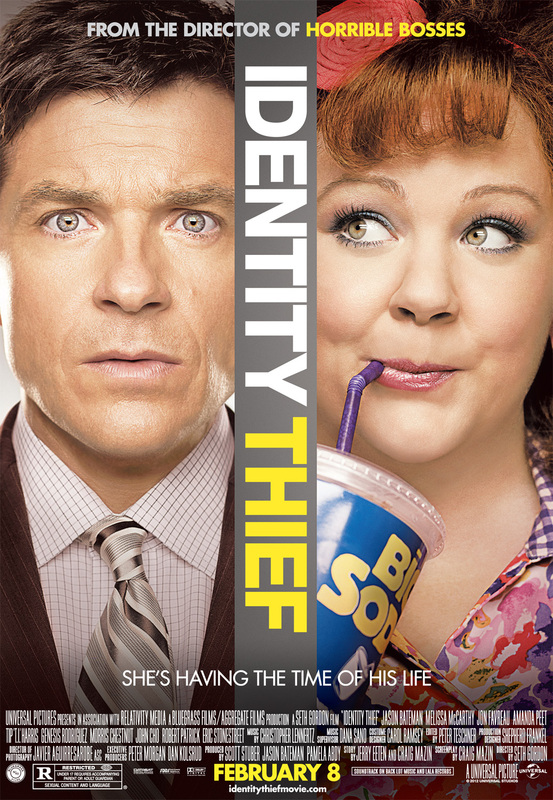 The original script actually called for the identity thief to be a man, so they took it in a completely different direction. But the creatives tried to capitalize on the success of McCarthy fresh off of Bridesmaids, which I think was the wrong choice.